This collection of Ivey & Crook's residences are in the northern most sections of Buckhead. I'll use a loose interpretation of the boundaries of Buckhead to include Tuxedo Park, Brookhaven, and the western end of West Paces Ferry Road. Many of Buck's most beautiful designs are contained on this page. Job #105, the Calhoun-Thornwell House, a.k.a. "The Pink Palace." While an apprentice with Hentz, Reid & Adler Buck participated in the creation of this home along with Neel Reid, Philip Shutze, Ed Ivey, and James Means. 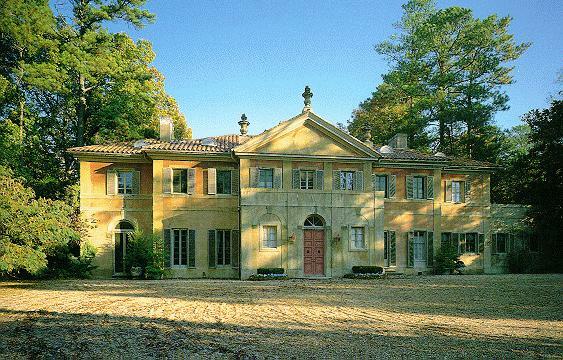 One of Ivey & Crook's first commissions was to supervise the construction of this estate in 1923. Here's the rear view of the house. Both photos are by Van Jones Martin from the book, Classic Atlanta. Job #312, Riverly, for A. Rhodes Perdue in 1935. This was the second home Ivey & Crook designed and built for their college friend: they were also responsible for 27 West Andrews, as well as many Rhode's Furniture stores. Job #545, built for my grandmother's boss, Archibald Gann in 1950. I think it is currently owned by Dr. Sanford J. Matthews. The home is too wide to fit in one picture -- here's another view. Job #574, originally built for Frank C. Owens in 1953. 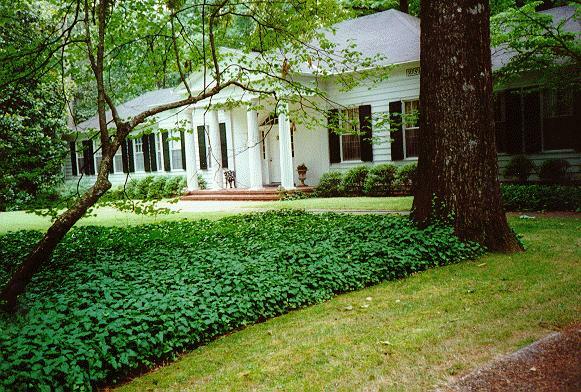 This Greek Revival home was recently (summer 1996) purchased for just under one million dollars. Job #586, for Mrs. M.F. Johnson in 1953: this is probably my favorite of all the homes designed by my grandfather, in perfect harmony with its surroundings. Job #356, built for A.J. Orme Jr. in 1938. This house is located on one of the most prestigious streets in Atlanta, and yes, I had to trespass in order to get a picture this close. 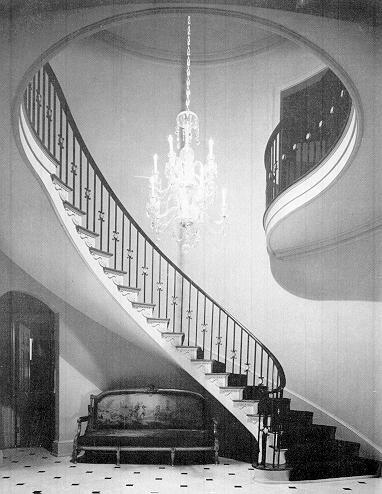 Here's a picture of the stairhall from the Crook Book. Job #541, for Julian M. Harrison in 1950. This house is sort of hidden from view from the road. Travelling west on West Paces Ferry, it's on the left, just after you cross Northside Drive. Job #562, designed for Welborn Cody in 1951, is located just north of the Governor's Mansion. Job #679, built for William E. Waters in 1963, the last residential property created by Ivey & Crook. Yes, I believe that's a trampoline in front of the Suburban! Job #126, for Mrs. F.A. O'Neal in 1924: one of only two Crook designs remaining in the elite Atlanta neighborhood of Brookhaven, this home borders the Capital City Club golf course. Job #331, designed for W.B. McClellan in 1937. Vermont Road is one of the prettiest in Atlanta. It is the main thoroughfare within the exclusive subdivision of Brookhaven. Job #507, built for C.C. Fambrough in 1948. Adjacent to Arlington Cemetery, north of Atlanta's "perimeter," Interstate 285.